If you’re considering building a new Adelaide carport, the design of your carport is probably one of your most important considerations. While the practical aspects of building a new carport are always important, the way it looks is also vital. 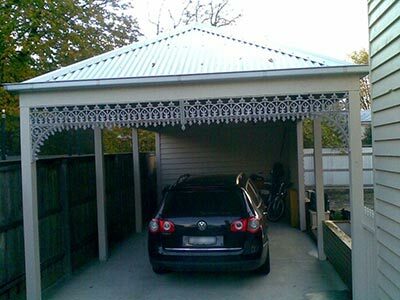 So how can you build a new Adelaide carport that will suit your needs perfectly while making it the best carport in the street? Making sure your carport matches or complements your home’s style is number one. Even a beautifully designed carport won’t look great if it looks like it belongs with another home. Continuing on from tip one, take a close look at your home. Is it a period-style house, a modern house or something in-between? This will dictate, perhaps more than anything, what style of carport you should build. If you have a period-style home, a carport with period features, such as finials and end-fills will look awesome, as will, for example, a rendered carport beside a modern, rendered home. Use similar materials for your carport as your home uses. For example, if your house features timber posts, use timber posts for your carport. If your home has a tiled roof, use tiles for the roof of your carport. The colours that you use for your Adelaide carport are also important. If it’s a matching carport you’re trying to achieve, obviously you’ll want to match the colours that are used in your home. If you want a carport that complements, choose colours that will complement the colour of your home. The size of your carport will also play a part in how it looks. We’re not just talking about the width and length of your carport, which is mostly dictated by how many cars or other items you want to protect, but also height. A carport that is well proportioned for the block and the home it’s built in front of or beside will always look best. To ensure your Adelaide carport is more stunning than drab, Mr Carports is the company you should entrust with your project. To organise a free, no obligation discussion, where we can also provide you with a free quote and design, phone Mr Carports on 1800 557 782. Or look at our Adelaide branch page for stand-out carports we’ve built with other customers.